Hand embroidery on cotton. 2018. 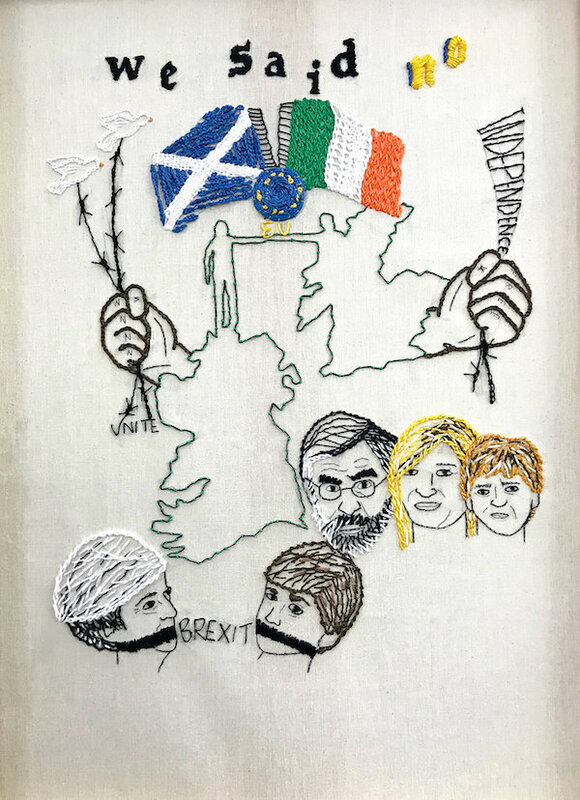 Nikkita : "This piece is a response to Brexit* and how the North of Ireland and Scotland said no. It includes key political figures and depicts Ireland and Scotland together and free from Britain." * 'Brexit' is the move by the UK (Britain) to exit from the European Union (EU) which it decided in 1975 to join. A Referendum on the question of whether to leave or remain took place in 2016 and was won by the 'leave' vote (52% to 48% in the UK, overall). However, the voters in both the north of Ireland and in Scotland voted to remain inside the EU. But since that Referendum the UK government has insisted that the UK as a whole will leave. The exact terms of the departure from the EU are the subject of so much contention, mismanagement and uncertainty by the British government that it has unsettled the political scene in the country. At the time of writing in early 2018 it is still not clear whether Britain will leave or remain in the EU, or if it does leave, when this would happen or on what terms.